There are all kinds of hardware and electronics in your office, and it’s easy to prioritise other items that need cleaning. But believe it or not, hardware and electronics need just as much cleaning as kitchens and bathrooms do. Computers and electronic items can be a gathering place for dust, grease, fingerprints and crumbs – and can get terribly dirty from their daily use in the office. They’re the piece of equipment used most in desk jobs. They’re frequently being touched throughout the day, and then being left to gather dust throughout the night. This combination means that regular cleaning is absolutely necessary. We’ll start by saying, the very best method of cleaning a electronic device is by bringing in a professional, or taking the item to a professional to clean. In offices, your electronic equipment and hardware is hugely valuable (likely storing projects, contracts and client information) so the last thing you want is an accident if you do it yourself. Bringing in a professional generally means you’ll be insured, and also means you’re trusting the item with someone who know precisely what they’re doing. They will have plenty of practise dealing with high-value items (especially electronics and hardware) so they will know how to handle the object and what tools to use when cleaning it. However… we know it’s not always possible to bring in a professional, so for those occasions, here are some cleaning tips for hardware and electronics in your office. Check the manual – there might be specific cleaning instructions to follow, or warnings of products / practises to avoid. Always power off the system (turn it completely off, not just standby). Always unplug the system (ensure no electricity is running to the device). Wear an anti-static wristband (available from Amazon or hardware stores). Never spray any cleaning products (especially fluid ones) directly onto your computer. Never allow any water or cleaning product to drip or puddle near circuit boards or wires. Of all the places in an office, one of the areas that can collect the most bacteria is your computer or laptop keyboard. 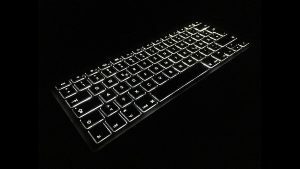 In most office jobs where the computer plays a central role in job responsibilities, the keyboard is used for almost every hour of every day. When thinking about this, it’s no wonder they need regular cleaning and sanitising. Step 1: Turn the computer off and disconnect from plug sockets. Before you start any cleaning process, make sure you unplug and disconnect any wires attached to the keyboard or computer. If you don’t, you run the risk of an electric shock, or damaging the electrical equipment. If you have a wireless keyboard, it may be worth removing the batteries from it too. Step 2: Shake out any loose debris. The second thing you’ll want to do is turn your keyboard upside down and give it a gentle shake. This will dislodge any big bits of grime or dirt and make the next part of the cleaning process much easier. There might be bits of food in there, or little bits of debris clogging up the key functions. Sometimes a quick shake can immediately improve the problem. Compressed air can help blow and budge any smaller debris out from underneath the keyboard. Compressed air is a pretty reliable tool for getting rid of dirt and dust, and you’ll be amazed at what might fly out from under those keys. Holding the canister at a 45-degree angle towards the keyboard is the best method to get dust and dirt out from underneath. Those little dips in-between the keys are often where stickiness can build up, and where germs harbour. If you run a cotton swab across these areas (dipped in isopropyl alcohol is effective) then you’ll clean the area, and also disinfect it too. We recommend wiping around each individual key, to help get rid of any oil, dust, grime, etc that may be lurking there. Lastly, polish your keyboard with a lint-free cloth. This will just help wipe away anything you’ve missed and get rid of any damp areas from the cleaning too. 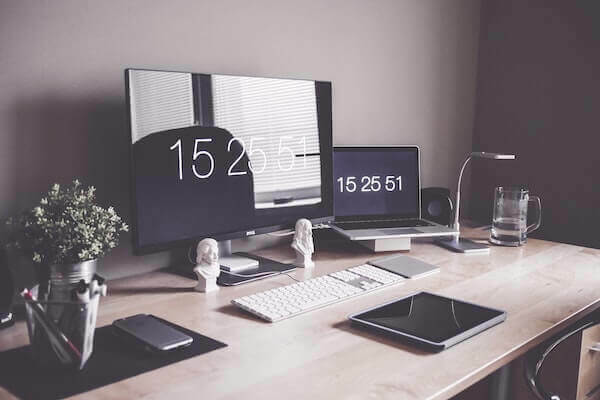 LCD monitors are probably the most common screen type within an office setting, and having a dirty screen can affect productivity and work output. It’s not difficult to give your screen a quick clean each day, and it’ll keep your screen performing better, and give off better image display too. Don’t use rough paper to wipe an LCD screen (such as paper towels). It can lead to big scratches across the screen surface. Always use soft cotton clothes, or soft wipes (specialist ones recommended for LCD screen can usually be purchased easily online). A dry cloth won’t remove grease from fingerprints, so for that you’ll either need the pre-damp wipes mentioned above, or you’ll need to purchase LCD cleaning liquid to dab your cotton cloth into. If your monitor is a little older, and is made of glass, then you can generally use regular glass cleaner on them. However, do not spray directly on the glass – always spray a little onto a dry cloth first, and ensure the cloth isn’t ‘dripping’ wet. CDs and DVDs can hold vital data, that when dirty becomes unreadable or lost. To clean a CD or DVD, we recommend using a small piece or cotton, or the small piece of material you’d use to clean your glasses. The trick here is to be super gentle, and to avoid causing any further damage – so keep your movements soft and smooth and keep the material soft and smooth too. Never spray cleaning fluid on a CD or DVD. If your mouse uses a ball to function, as many still do, you may need to give it a regular clean in order to use it functionally. Giving both the underside of the mouse, and the ball itself a clean with a dry cloth, should remove any dirt or dust and help restore function and reactiveness to the mouse. It’s also a good idea to blow air inside the mouse once the ball has been removed – as this can help dislodge any bits of dirt inside. These won’t need as much cleaning as the regular mouse, because of the lack of ball function. However, it’s still a great idea to clean it, to keep it hygienic and keep it functional. A quick wipe down with a lint-free cloth can do wonders, and to get rid of those bits of dust covering the lens area, a little air should blow it away easily, or a cotton swab should be able to grab them too. Following these steps every week, or every couple of weeks is a great way to keep bacteria at bay, and ensure you’re equipment is clean and germ-free. If you can get your co-workers on board, you could even assign 20 minutes each week where you all set aside time to do this small task and make sure it has been done. We hope this blog post has helped you understand a little more about cleaning your electrical equipment within your office. For more high-tech items, or cleaning the internal areas of a computer or electrical item. we highly recommend finding a trusted professional.